Visualisations. The legal system is a complex web of precedent, jurisdiction and statute that has evloved over centuries. It is often difficult to quickly see how all of these parts relate to one another. Visualisations allow you to see the relationships in the legal system quickly and in a visually impressive way. What makes it powerful is that JADE lets you drill down on the graphic and see the words are responsible for the colours. The option to generate visualisations appears throughout JADE and can be accessed from multiple screens. Similarity. This presents cases which we think are similar to the document being viewed. Hotspots. This presents combinations of cases cited by the current document, which we think are closely related to each other and are relevant to the current document. It is experimental. 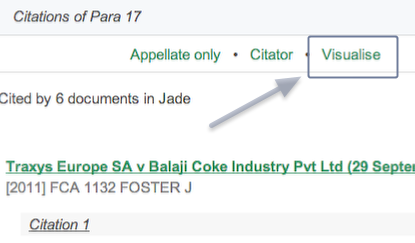 JADE will let you drill down and visualise how a paragraph of a case or section of an act has been cited. You can do this whilst you are scrolling through a case by clicking view all on the citation pop-up on the right hand side – This will then give you the options to visualise see below. 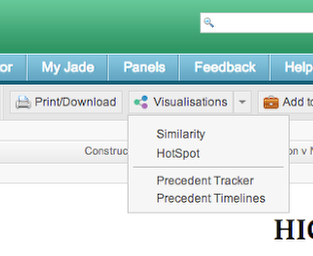 By clicking visualise JADE will generate a ‘Precedent Tracker’ visualisation so you can track how a section has been dealt with in later decisions. This works with both legislation and cases. The visualise option appears from the search results view. By selecting Visualise “Overlap” JADE creates a graphic showing two things. One. 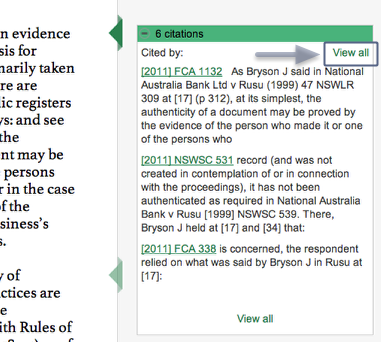 All of the instances where two or more of your search results cite the same case e.g. If your search results include  HCA 13 and  HCA 48 and both of these cases cite  HCA 54.